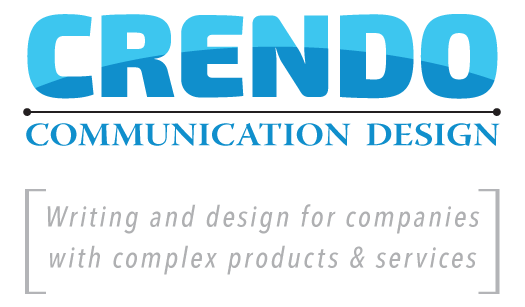 Crendo Communication Design specializes in writing and design for companies with complex or highly-technical products or services. (Or as I sometimes put it when I’m in a hurry, I explain things with words and pictures.) Crendo is currently a one-person company, but I’ve been in business since 1995 and at various times have had a few other folks in the band. Some of the projects I worked on in 2018 include a 20-page research paper for a client wanting to get into a new area of business, writing and illustrating a 10-page technical white paper for Adobe, writing a 10-page manual for a government department on how to view and print their PDFs on mobile devices such as tablets and cellphones, updating a software manual to include instructions on touch screen signing of documents, updates to an existing multi-manual documentation set for software used by state governments, updates to a long-term client’s website and brochure, and writing all-new content for a major website redesign. I have a degree in Journalism and a certificate in Technical Writing, and have more than 25 years experience in creating web content and writing instruction manuals for both hardware and software. I’m located in Salem, Oregon, and have worked with clients across the USA.